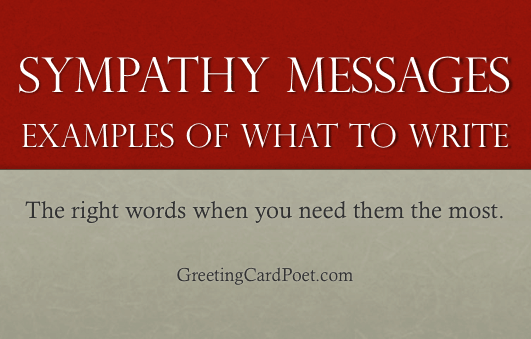 Sympathy messages are difficult to deliver both in person and in writing. Everyone seems uncomfortable with saying the wrong thing during difficult circumstances. What are the right messages to write on a card? It’s not easy. It takes some thinking; but we’ve done some of the heavy lifting for you. Check out these sympathy sayings and words below. Thoughtful sympathetic words are important. Death can not only be heartbreaking, it can also be so complicated for us to understand. It is a loss that can have far-reaching consequences in people’s lives. For most, it is the time when your loved one needs all the support, love and understanding in the world! Writing a sympathy message can go a long way in making them feel comforted – even though by a very small margin, it is going to contribute after all! Sadly, death can be so complicated that writing a comforting note can be a difficult task in itself. The following sympathy messages can help you find the right words to express your sympathy, support, grief, sorrow and love for your friend or loved one who has experienced a close-one’s death. Friends rely on each other for so many things. When a friend suffers a close-one’s death, it is natural for you to show your sympathy and support. Your presence can make a big difference, but your words can be as comforting too! I was saddened to know the passing away of your loved one. My thoughts are with you and your family. When people we love pass away, they continue to live on in our memories. I am praying for you and your family in this difficult time! The pain of losing a loved one can be unbearable. You don’t have to go through this alone! We are also with you. Please accept my deepest condolences! I pray for you to get through this tough time with the knowledge that God loves everyone! Hope you will find peace in the thought that God takes care of everyone! There are no words that can describe your loss, but I am sending comforting hugs and healing prayers for you. I was deeply saddened to know of your loss! I will be praying for moments of comfort and peace as you remember him! Even when the body dies, the soul continues to live on. She has a beautiful soul that touched everyone in positive ways! I can understand what you are going through and how you are feeling. My deepest sympathies and support are with you! I want you to know that I am always here to listen to you! Thinking of you during these difficult times. We are deeply sorry to hear about the death of “name of deceased”. Sharing your sorrow at the loss of someone so dear. Thinking of you with sincere sympathy at the loss of someone so dear. We share comfort in knowing “name of deceased” is no longer suffering. Sending thoughts of sympathy and support to you. When reason fails, pray for peace. We will be praying with you. Wishing you a speedy calm to the storms of life. Keep the one you loved close to you in spirit and thought. May you find comfort in knowing that others are holding you close in their hearts. Sending comforting thoughts your way. Our hearts are filled with tender thoughts and memories. Check out our messages for occasions like birthdays, weddings, anniversaries and more. Remembering you and “name of deceased” in our minds and in our hearts. NOTE: Sympathy card sayings expressed in the appropriate tone and with feeling can do much to help ease the pain of loved ones who have suffered a loss. Many people want to hear those stories about the deceased’s better points. Be prepared, and don’t self-edit too much. The same goes for every sympathy card you write. When expressing messages of condolences and sympathy, be thoughtful and let folks know how you feel. The loss of a husband can be devastating and life-changing. A few words of sympathy and your support can at least soothe the pain. I know that there’s nothing that I can say that can make things better. But I want you to know that I love you and I am with you in your moment of pain and grief. I always admired him for his faith and strength! I will always be inspired by his actions and words. He will continue to live in our memories! I know how much he meant to you and his loss cannot be replaced. Someone so special and close can never be forgotten. I am also sharing in your loss and sorrow! I want you to know that we never lose those whom we love! They continue to live in all our memories, thoughts, acts and decisions. We find peace and comfort in having shared their love! When a loved one passes away, they continue living in us! The memories we share with them makes them a part of us forever. You have all my love and support in this time of grief! Words can’t do justice to explain how much we will miss him. He will continue to live in our memories! 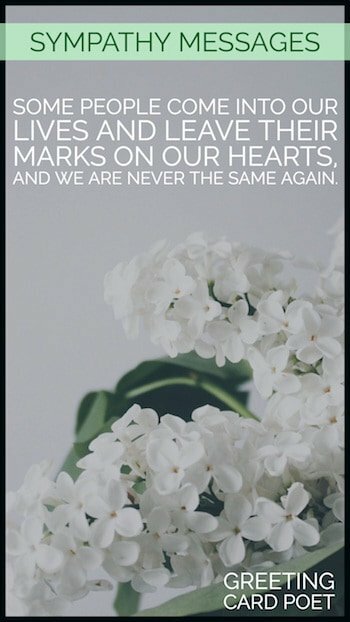 Some people come into our lives and leave their marks on our hearts, and we are never the same again. May her soul rest in peace. I am deeply saddened by this unexpected loss of your loved one. You and your family will be in my prayers and thoughts! The death of father can mean a big loss for any person at any stage in their lives. A few words of sympathy and love can be touching and soothing. I know I can’t fix the pain you are feeling, but I want you to know that I am thinking of you and I feel for you. I would do anything to help you! Please remember that you are never alone. We will always be here for you! I am thinking of him as everyone celebrates his wonderful life. I know your father’s memories will always live in your heart! A great soul always serves others and makes this world a better place! Hope he will also find peace on the other side! My prayers and thoughts are with your family! In this hour of grief, I pray comfort for you in the thought that your dad and his memories will always be in your heart! Our hearts are with you in your time of sorrow. Your father was a great man. We know how close you were to your Dad. Please know that our thoughts and prayers are with you. When great souls die, our memory suddenly becomes sharp and brings back kind words and fond memories we had with them! May his soul rest in peace and that you find comfort in knowing this. Losing the very person who gave you birth can be so unbearable. A few words in the form of a condolence can at least give the person a consolation in knowing that you care and support them. I know how big a loss this is for you. But I want to let you know that the memories of your mom will always remain with you. I pray that those memories will give you peace and comfort! People we love may be gone from our sight, but they always remain in our hearts! May you find peace and comfort in their memories! Words cannot even begin to express the loss and sorrow! She was an amazing person! I will remember her fondly and I feel blessed to have known her. She will always be missed! Our deepest sympathy for your loss as your mother brought so many gifts into everyone’s lives. Our hearts are deeply saddened by your loss! I want you to know that our prayers and thoughts are with you and your family! I love you and want you to know in this hour of grief that I am always here to help you! They say that when someone you love passes away, they start living in your memory! I know her memory will become a treasure that will always give you peace and comfort! There is a flood of emotions when someone you love so much passes on and the feelings can be too difficult. But I am here to share your grief and sorrow. They say there is no bigger loss in life than losing one’s child! Nothing you do can give comfort to the soul of a grieving parent. However, with a few words of comfort you can expect to make the smallest difference that can be! No words can describe this loss. I am always here for you. Please let me know if I can be of any help! There is nothing that I can say or do that can make things better. But I want you to know that you and your family are surrounded by all the love in this time of grief! I know how big a loss this is to you and your family! I want you to know that what we have enjoyed in life can never be lost. Everything that we love deeply becomes a part of us. I hope my words will bring you peace and comfort! Life is always eternal and love is always immortal! May you find comfort in your love for him in this hour of grief! Those we love and lose are always there in our hearts! I want you to remember this in this difficult time of your loss! Someone once said that the most beautiful things can never be touched. They are to be felt in your heart. He was such a beautiful soul and I know that she will always be in our hearts. Words also cannot describe this loss that we all are experiencing! I deepest condolences are with you and your family. Sympathy notes and letters can be difficult to write. Looking for what to write on a sympathy card? How do you express your condolences and sympathy? Below are some words to consider as you craft what you’d like to say. “Name of deceased” brought so many gifts to our life. We will never forget him/her! “Name of Deceased” will remain in our hearts forever. Condolences on your loss. May you find strength in the love of God. Words can’t express our sorrow. In sympathy and friendship, wishing we could be by your side at this time. It may seem hard right now, it will be these memories that help push away the pain. It will be small things that you will remember: a smile, (name of deceased) laughter and the strength. Keeping you in (our) thoughts and prayers. You and your family are in our thoughts. There is nothing that I can say that can change things in this time of your loss. But I know that you will always have him in your heart and that is where you should find comfort! I am always here to support you! Remembering her and praying for your wonderful mother! I wish you and your family all the comfort and courage in this difficult time! Please remember that you are not alone in this difficult time. I am always here for you! Both life and death are complex. It can be easier to bear the pain with friends. I am always here by your side! I am sorry to know of your father’s passing. He was a kind and smart man. I want you to know that you and your family are in my thoughts! May your spirit focus on all the love around you during such a difficult time. Praying for friends to comfort you, faith to uphold you, and loving memories to heal. May hope and peace by yours today and always. May the care of friends bring you comfort and loving memories heal your heart. May the Lord comfort your heart as only He can do. May the morning of prosperity shine on your evening of adversity. At a time like this, there is sorrow for which no heart could ever be prepared. A light has gone out and it is sad. May the sunshine of comfort dispel the clouds of despair. May the love of friends & family lift your spirits. Note: If you have sympathy messages you’d like to see included on this page, please let us know on the contact page. Thanks. May your special memories help you find strength. The world lost a treasure and I lost a friend. Wishing you peace during this difficult time. Words are not enough to convey my sympathies at a time. We’ll say a prayer for you and your family. Accept our peace, prayers, and blessings. You’re on Sympathy Messages page.